Is it true that youth is wasted on the young? Perhaps not, at least this group of youngsters is making the most of their time and talents. And yes, I am a little jealous. There is a good deal to be said for getting an early start. Youth is lithe and agile. It is a great season for dancing, Movement can be the lingua franca for the young; it is their body language as it were. Ellen Robbins’ Dances By Very Young Choreographers at Live Arts, on January 26th and 27th, will be showcasing works by children as young as 8. The dance-makers, ranging in age from 8 to 18, study modern dance and choreography with Ms. Robbins. The program ranges across the many styles of dance performance, from the humorous, narrative, to the lyrical. The music selections, chosen by the choreographers, include folk, jazz, classical, contemporary. Ellen Robbins has been teaching dance sine 1966 and has received honors for her work with children. She has taught dance education at Sarah Lawrence and been on the faculties of Bennington College, the 92nd Street Y, and other distinguished institutions. In 2001, Dances By Very Young Choreographers was on the program at the Jacob’s Pillow Dance Festival. After the matinee on January 26th, there will be an evening concert by the Alumni of Dances by Very Young Choreographers, which presents work by dancers who studied with Robbins from 1982 to 2016. There is a long-standing connection between the United States and our neighbors to the south. Today, being the 5th of May, or Mexican Independence Day, is a good time to talk about a musical event at our neighbors in Queens. A Mexican Affair presented by Convergences Theatre Collective will play through August at the Paper Factory Hotel’s Rose Room . Created by Rafa Reyes from the fusion of music of our two cultures, and performed by him along with Felipe Fournier on vibraphone, Dan Martínez on bass, Hugo Moreno on trumpet, Joel Mateo on drums, and percussionist Guillermo Barrón, A Mexican Affair celebrates with good food and song the bonds that tie us. In the theater, the sounds of a crowd pleased are often accompanied by a standing ovation for those who pleased us. It is a way of saying thanks. Our gratitude makes us feel good, too. We yell “Bravo” and are rewarded with a sense of our magnanimity. Our approbation fills the theatre. Applause, like laughter, are contagious. While watching The Joy of Sax, at 59E59’s Theater A, it occurred to me that Jazz is often a conversation between instruments. 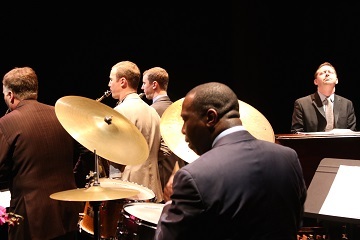 Pat Bianchi’s Hammond B-3 organ chattered with Kenny Washington’s drums. Don’t think of the Hammond B-3 organ as belonging out of church? Think again. It has a versatile voice with lots to say for itself. The three saxes, Pater and Will Anderson and Harry Allen held interesting commentary back and forth. All this on International Jazz Day (April 30th.) 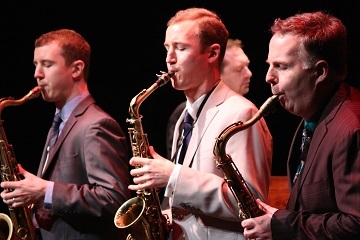 The Joy of Sax plays through May 7th. To find out more about the program and to get tickets, please visit 59e59.org. 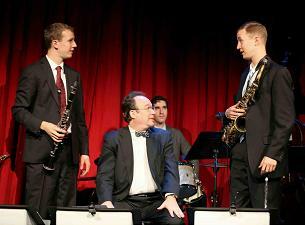 Note that the Anderson Twins also hold a post-show live Jazz show in 59E59’s E-Bar on Thursday nights. The joint is jumping, you better believe it! Swing, swing, swing is in the air as the fabulous Andersons give a tribute to Tommy and Jimmy Dorsey at 59E59 Theaters through October 7th. “The Anderson Twins Play The Fabulous Dorseys” is set to snippets from the film “The Fabulous Dorseys” with a charmingly cornball script by the brothers Will and Pete. Pete Anderson, Jon-Erik Kellso, Kevin Dorn and Will Anderson in “The Anderson Twins Play The Fabulous Dorseys” at 59E59 Theaters. Photo by Lynn Redmile. For more information and tickets, go to www.59e59.org. Is it only the idealists among us who search for the unattainable? Can the melancholic also pursue it? 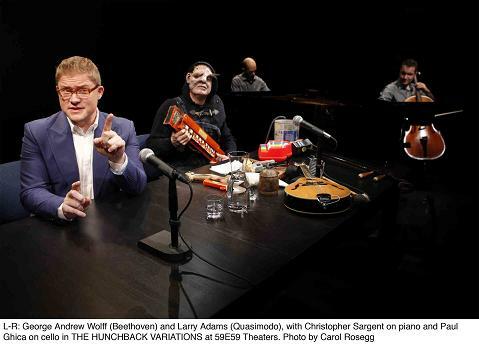 Quasimodo and Beethoven, both deaf and more than a touch ornery, are holding a series of panel discussions on the inevitable failure of their project. 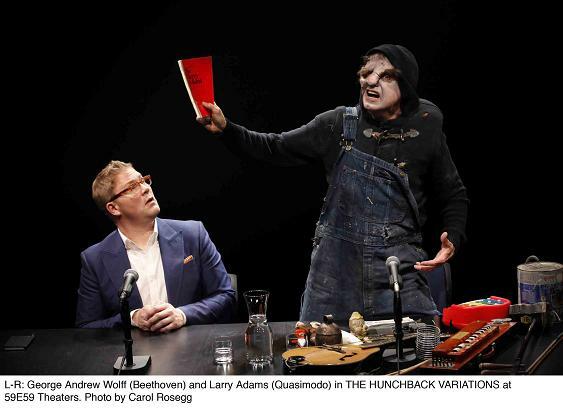 The attempt to create “the Impossible, Mysterious Sound” and “the Effects on Love and Friendship of Rehearsing the Creation of the Impossible and Mysterious Sound” are the subject for “The Hunchback Variations, A Chamber Opera.” The sound is “impossible” because it is one of nostalgia for something lost or missing or not existent. 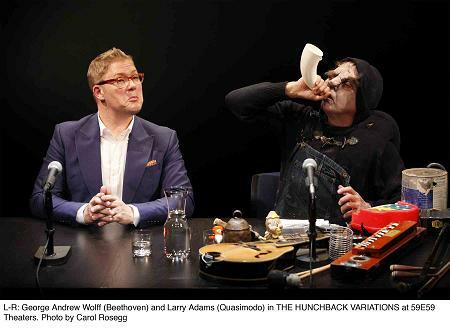 Beethoven and Quasimodo are trying to find something that eludes the senses.